A controversial question throughout the ballet world surrounds the “correct” age for dancers to go en pointe. For the aspiring ballet dancer, pointe work may begin at a much younger age (approximately 11 or 12) than perhaps a dancer who enjoys the “ballet tights ideal” of one or two casual classes per week. Many strands run through the age argument, such as those regarding the height of the instep, the individual and relative strength of the foot – in its complex structure of bones, ligaments, tendons and muscles – and the dancer’s ability to control their body en pointe. Naturally, different circumstances affect each and every decision to train the body for this transition into pointe shoes. In addition to this debate is the decision of the brand and type of shoes to select. 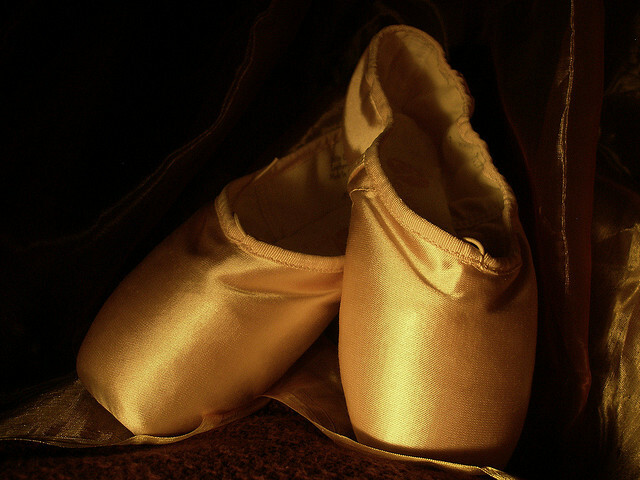 Each foot requires different constructions of shoes, and a ballet dancer often remains committed to one type of pointe shows throughout their whole career. The most popular choice of brands appears to centre on those from the likes of Capezio, Bloch, and more recently, Gaynor Minden. Each shoe has its own appeal and its own unique design, meaning a first fitting for pointe shoes can be a rather long process! Despite the fact that there are few bespoke creators of pointe shoes, brands can often be customised by the dancer to suit their own feet. For example, the Freed Studios shoe, as a stock shoe, tends to fit many people. However, an increased workload or intense pointe classes may mean that a more customised shoe is needed. Bloch shoes, in comparison, have been seen to incorporate rather innovative techniques of heating the shoe and using this to mould its shape to the individual foot. This therefore emphasises that the art of acquiring pointe shoes is no less than the art of twirling in a tutu: the shoe must be completely right for the foot that may one day posé into a leading role.